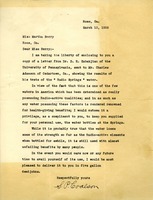 S. P. Coalson writes to Martha Berry with a copy of results from a "Radio Springs" test to let her know that it is one of the few radio-active water sources in the nation. Coalson mentions that he would be most pleased to deliver it to her in five gallon demijohns. 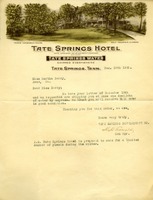 Tate Springs writes to Martha that they are sending her a demijohn of water having received her receipt. 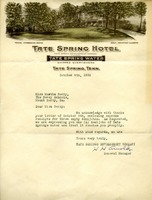 The General Manager of Tate Springs Development confirms having Martha's letter from December 16. They are at once shipping her one demijohn of water. H. H. Arnold writes to Martha to acknowledge the three demijohns that Martha sent and that they are sending one demijohn back. Martha Berry purchased a demijohn and case of Tate Spring water for $4 and has $8 on account for previous purchases. 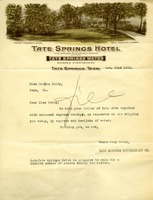 Tate Springs Development Company informs her that the Tate Spring Hotel has been sold to the Development Company and she must settle her balance.